Too many games take themselves fairly seriously. Take last year’s Far Cry 3, which told the fairly dark story of a young man traveling down the path of violence as he searched for a way to get off a terrifying island. That game’s standalone expansion, Far Cry 3: Blood Dragon, could not be further from that premise. This game exists in a zany alternate reality where everything is covered in neon lighting and one could feasibly insert the words “laser” or “cyborg” anywhere in a sentence and still have it work. Blood Dragon is ridiculous, and endlessly endearing for that reason. Blood Dragon takes place in an alternate version of 2007 as envisioned in the 80s where a Mark IV Cyber Commando named Rex Power Colt must journey to an island filled with mutants and Blood Dragons to combat the evil Omega Force cyborg army and save the world. There is not an ounce of exaggeration in that synopsis; it is literally what Blood Dragon is about. It’s not often that a game feels tailor-made for my sensibilities, but this is one of those cases. When stripped to its core, this is basically Far Cry 3. You have the takedowns and mechanics that game boasted, as well as the enemy camp liberations and open island (albeit way smaller) to explore. Thankfully, Blood Dragon doesn’t require that you start from square one with abilities. While you don’t get the robust branching skill tree tattoo that the core game had, Colt does start with several of the abilities that had to be earned in Far Cry 3, and new abilities or general skill buffs (an extra health bar, a few extra seconds of held breath when scoped) are awarded with each level. These are set and cannot be chosen, but most of them make big enough of a difference for them to be welcome. Of course, they also turn Colt into an absolute killing machine that makes the game a breeze on everything except for Hard difficulty. There are new additions as well, offered by way of Adventure Cabinets, which give a specific mission type ranging from rescuing a scientist from a group of soldiers to the more familiar hunting missions, which offer rewards in the form of weapon upgrades. The true stars of the show, however, are the Blood Dragons themselves. These are massive, radiation-fueled lizards that shoot lasers out of their mouths that lay waste to entire battalions of soldiers. These are formidable foes, but they can be coerced into attacking enemies by tossing Cyber-Hearts into garrisons. These will attract nearby Blood Dragons and cause them to lay waste to anything that moves. The game weaves in other elements of bombast as well, such as a multi-barreled shotgun that fires flaming rounds. This is by far one of the funniest games I have ever played. Blood Dragon is very profane and extremely stupid, taking the cornball 80’s action movie vibe all the way home. 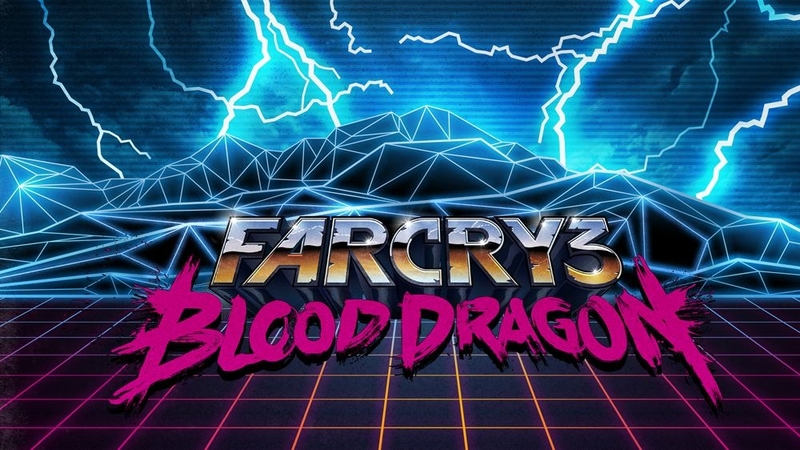 This is a game where Colt rips mechanical hearts out of his enemies, then asks them if they’re “heartbroken.” The one-liners are perfectly cringe-inducing in the best possible way, and the entire script is written with a razor-sharp self-awareness; the era of entertainment that Blood Dragon apes was enormously dumb, and the game embraces that without an ounce of shame. In what might be the finest touch, cutscenes are executed by way of voiceovers accompanied by 16-bit Contra-style slides. The soundtrack by Power Glove perfectly straddles the line between referential Terminator-esque bombast and period-appropriate electronica; it is rife with practically every synth sound available, and pulls of the feat of being both epic and goofy at the same time. This might actually be one of the better video game soundtracks to come out of the industry in several years. There are also more blatant riffs on movies and games in general, such as the talking HUD mentioning the flamethrower enemy’s “conveniently exposed fuel tanks” or a hysterically drawn-out tutorial that teaches things such as jumping, and coyly offers a (fake) paid upgrade to skip the tutorial as Colt grumbles his way through it. Even the loading screens deliver such idiotic lines as “Colt is equipped with a Cyber Eye–it does stuff” or suggesting that if you want to be stealthy, maybe you should stop using assault rifles because they make a lot of noise. At every conceivable chance, Blood Dragon makes sure that it’s delivering some sense of insanity. Is Far Cry 3: Blood Dragon the greatest thing ever? No, it’s not—but in a way, it is, with the right audience. It is the purest product of a set of minds completely unrestrained by anything or anyone, and a neon drenched love letter to those insane action films of the 80s. It’s gloriously unhinged and completely irreverent. Non-fans of 80s sci-fi exploitation cinema won’t love it quite as much, but for the rest of us, the insane, amazing atmosphere makes this a truly singular experience that is as awesome as it is screamingly hilarious. There aren’t enough games that are this purely entertaining. Far Cry 3: Blood Dragon was developed by Ubisoft Montreal and published by Ubisoft. A PC copy of the game was purchased by the editor for review purposes.